What’s New? Let our Editorial Calendar tell you! 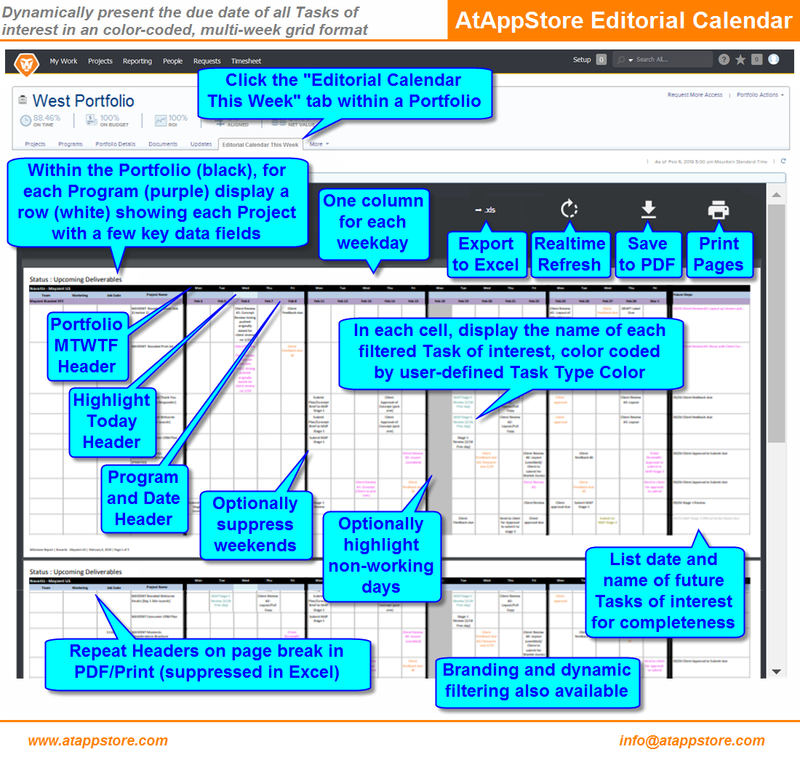 Our Editorial Calendar dynamically presents the due date of all Tasks of interest in a multi-week grid format (with or without weekends) and beyond, for each project by every program within an entire portfolio. Choose the configurable custom tabs embedded directly into Workfront at the portfolio level to view one or more weeks (with or without weekends and beyond) worth of information and show the corresponding due dates of the tasks of interest. The key information then presented in our standard layout, with colors you control to spot clusters and trends. We invite you to learn more about our Editorial Calendar to see if it’s a fit. How much time are YOU WASTING chasing schedules? Check out Just In Time Resourcing, JITR™! AtAppStore Inc. has been Workfront’s partner and premier VAR since 2009. We believe that Workfront is the best work management platform in the world. We are experts in Workfront, and spend our days helping customers improve their businesses by configuring and extending Workfront. We strive for efficiency in all we do, and love saving our Workfront clients time. We have leveraged our familiarity with the Workfront APIs to bring innovative solutions to the Workfront community. Our goal is to provide these Solutions at an attractive price, allowing Workfront users to save time. In short: when you’re ready. If you’re just starting with Workfront, you’ve probably got enough new ideas to keep you busy for a while. Once you’re over the learning curve though and start recognizing the edges of where Workfront maps your business, we can help you take it to the next level. 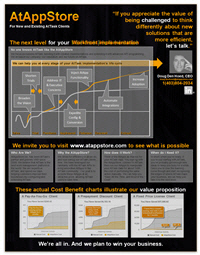 “We are passionate about increasing the value our clients get out of Workfront. Which interests you the most within Workfront?